The purpose of using Nitrogen for inerting, blanketing, and purging with oil platforms and refineries is to suppress flammability by reducing oxygen levels to a point below which combustion is possible. Nitrogen is a clean, dry, inert gas and has long proven effective at displacing oxygen in tanks, hoses, and piping in order to minimize the presence of oxygen, preventing the potential for combustion. Nitrogen gas is used in the drilling phase of the oil and gas industry mainly for purging and inerting systems to keep instruments dry, effective, and efficient. Nitrogen provides a dry air source that can prolong the life expectancy of a drilling system and keep instruments working properly. Nitrogen is a low density, high pressure gas that can absorb and displace fluids in wells to keep an optimal flow. This process during completion is known as Nitrogen Circulation. N2 gas can also be used to purge systems to reduce hydrogen sulfide concentration in residual oil and gas. 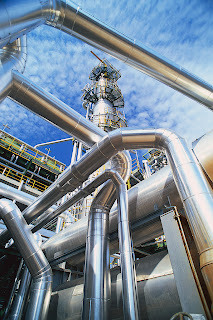 In addition, Nitrogen is used for blanketing storage tanks to maintain pressure. Considering all the uses of Nitrogen gas during the drilling, workover, completion, operation, and maintenance of oil rigs and fields, it is important to consider the benefits of using a Nitrogen Generator to provide a steady supply of high purity N2 gas on-site and on-demand. Membrane Nitrogen Generators are often used in the oil industry and South-Tek Systems designs and manufactures Membrane Generators, as well as PSA Nitrogen Generators, specifically for these applications.